Manuel Amorin was born in Chemnitz, Germany, and has lived in Berlin, Paris, Sao Paulo and Buenos Aires before moving to his current city, Montevideo. He earned his Masters in Advertising in 1999, in the ORT University. He has achieved an extensive list of recognitions, including 7 Cannes Lions finalists, 12 Effie awards in Uruguay, 1 Effie award in Argentina, 4 Ojo de Iberoamérica, 3 FIAP, 1 Wave Festival, and many Gran Prix and golds at the local festivals, the Campana de Oro and Desachate. 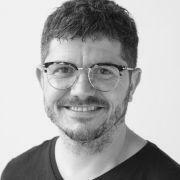 He earned a spot on the direction board of the Uruguaian Circle of Advertising two times, and has been a member of the Jury at the Ojo de Iberoamérica, FIAP, Campana de Oro and IAB Festivals. He is currently a professor at the ORT University, teaching Creativity in Advertising.